Smooth, juicy fruit flavors! 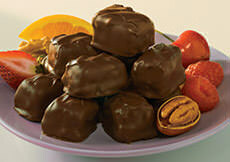 Here's a deliciously sugar-free version of our popular Fruit Delights. 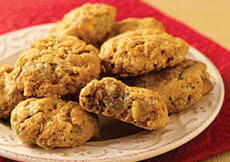 Includes Strawberry-Walnut, Raspberry-Pecan, Pineapple-Macadamia, Orange-Walnut, Blueberry-Pecan, and Peach-Walnut flavors. Kosher. INGREDIENTS: maltitol syrup, nutmeats (walnuts, pecans, macadamias, cashews), sorbitol, pectin (pectin, disodium diphosphate, sodium polyphosphate, dextrose, dicalcium phosphate), maltitol, modified cornstarch, natural and artificial flavors, sodium citrate, citric acid, malic acid, red 40, yellow 5, yellow 6, blue 1, soy lecithin. I LOVE this candy! I treat myself to it about once or twice a year, and have given it as Christmas gifts. Not too many things in this world that are sugar free or no sugar added that taste as good as these! A delicious bit of heaven! Definitely a gulit free treat for those of us who have to carefully watch our sugar intake, or anyone who wants the flavor without the guilt. I have found absolutely no difference in taste from the original to the sugar free! My sister-in-law lives in Seattle and one Christmas, she sent me a gift box of sugar free candy... Aplets & Cotlets and Fruit Delights! I loved them from the first delicious bite.They are now my FAVORITE sugar free candies. Keep up the great work, Liberty Orchards!!! I have several family members who are diabetic, including myself. I have never liked a treat as much as I like Sugar-Free Fruit Delights. They have a wonderful texture, a great assortment of incredible flavors, and I can eat them (or give them as gifts) with no guilt at all because they're sugar free. Thank you so much for offering these wonderful fruit delights - they are awesome! As a child I sold Aplets & Cotlets for Campfire Girls fundraisers. I sampled a box myself and was immediately hooked. One of my favorite childhood books mentioned Turkish Delight. 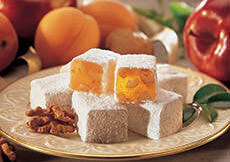 What fun it was to discover Turkish Delight is what I had been eating. As an adult I am a Type II diabetic who must stay away from sugar. I was more than delighted to discover a childhood favorite in a Sugar Free version. After consuming the whole box I was shocked to discover (from another review) there was no actual fruit in them, because the flavors all tasted true to me. I especially loved the berry flavors, so my next purchase will be an all-berry box. Thanks for caring about special-needs folks. You've given me back some of my childhood. Any possibility your soft Peppermint/White Chocolate candy will be issued in sugar-free some day? Liberty Orchards Reply: Thanks for the memories, Debra! And thanks for your suggestion about a sugar-free version of our white peppermint confection. We'll add that to the idea list! But today I tried out a brand new box of Liberty Orchard fruits. And I can share them too. Why? Well because these are also sugar free. Yes they are delicious too. I was wondering if they could hold up to my favorites and they did. Our Gentleman here is diabetic. He too can indulge in a lil treat now too. Top it off that the box has 48 pieces in it. So I do not feel like I will lose out when I share them. Now for me can this get any better? Yes, it can. I found I don't have to wait to get them in our lil store at the holidays. No I can order them online. Wow, why did I not think to look for this before? So we all know where my few extra dollars are going to be going soon. Okay, we have a happy woman. No fruit in the Fruit Delights is a great disappointment--and may explain the lack of fruit flavor. Just sugar alcohols, artificial colors, and pectin. What is going on? Liberty Orchards Reply: Robin, we're sorry about this and wish we could do it differently. 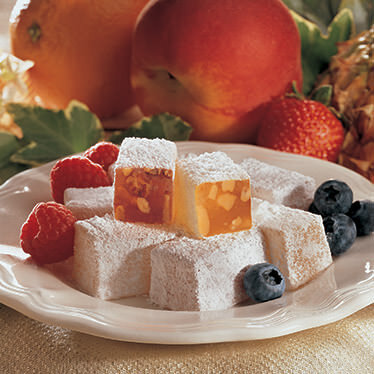 But, there is no fruit in Sugar Free Fruit Delights because sugar is a key component of the fruits we use. To make a sugar-free product, we simply can't use fruit because the product would no longer be sugar-free. I bought this in Washington State at a mall. It surprised me at how good it was. It never made it home to Oklahoma City! I bought this product while I was visiting my daughter in the beautiful state of Washington. I bought it to take back to my husband in Oklahoma City. Remarkable "true" flavor,and a pleasure to eat. So nice to find a sugar free candy that is really good. We received these as a gift this Christmas. As my wife is concerned about her carbs, they have been a wonderful sugarless dessert. One or two pieces are filling and indulgent. Although extremely tasty, the aftermath of intestinal distress is TOOO much to handle. Never had any troubles with any of your regular sugar-added products by your company, the sugar-free caused extreme painful gas build-ups each, every time ate one, two or more was even worse beyond words! My family and friends who received these felt the same terrible intestinal distresses. Even though there is a warning about "over- consumption may cause a laxative affect", that was mild compared to what really happened. I never experienced such an awful outcome when I had the regulars. We have been regular product customers for years, this was the first for sugar-frees. Please don't continue making them until you find another way to lessen caloric intake as well as real sugars by finding a different ingredient that replaces the sugar. Please do something about this. Liberty Orchards reply: Tina, we're very sorry to hear about your experience. The laxative effect of the sweetners we use in our sugar-free products is an unfortunate side-effect for some customers. These ingredients are safe and FDA-approved, and are used by food manufacturers in 1000's of popular sugar-free products. We have made every effort to clearly communicate on the package that these confections need to be eaten in moderation, which is true for any product which uses these ingredients. We are on the constant look-out for sugar-free sweetners that don't have this effect, but haven't found a satisfactory substitute. In the meantime, we'll continue to produce these candies for the thousands of customers who buy them regularly and who don't experience the laxative effect that you experienced. Thank you for your comments, and for your patronage over the years. I bought these treats because a sales person at World Market suggested them. They are the best candies I have ever eaten. I had Gastric Bypass Surgery and can't have the sugar in regular candies. These are not only delicious, they are also satisfying. Can't wait to get more and give as gifts to my friends. Thanks Liberty Orchards, keep the sugar free coming!